It has been a while since this idea came in my mind. I experimented to find a better way managing the train flow. 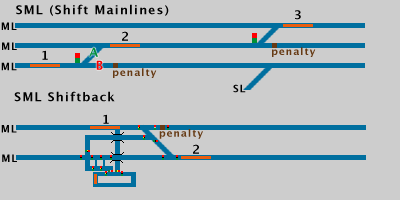 The main idea of the SML concept is to shift trains to other tracks if they are free and joining trains use this free track. If the track is not free, the others aren’t either. This works very well but has a disadvantage too: train’s entering a station will primarily enter via the shift-tracks (the innermost). That’s the point where “shiftback” comes into play. 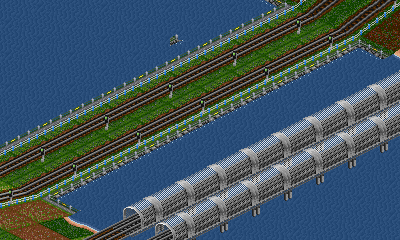 I thought it is time for some more tricks and tips when playing OpenTTD. All of us use diagonal tiles when building train tracks. Of course, they are important. But you should know for sure that one diagonal tile has not the same length as a vertical/horizontal tile. This comes into play in a couple of situations. First of all let’s have a look at the basics. After fiddling around with a lot of video tools I created a first Video Tutorial of the ‘Osai-like’ Terminus Station. Mainly for those who want to follow the whole process in detail and also for those who want to check out the quality of this video. This is my first Video and I didn’t edit it too much. Give me some comments and feedback. Additionally I created a Video Directory where you can browse and download videos.